Hot Door, Inc. is a software development company based in Laguna Beach, California. The company was started in 1995 by Brendon and Shari Cheves. Products include commercial plugins, like CADtools and MultiPage, as well as online applications and projects like this custom web site and online store. In the last 15 years, the business has grown steadily and added distribution of carefully selected third-party plugins. Each year the focus remains the same: user-friendly software tools for design professionals. We always enjoy giving our customers personal attention with free, friendly phone support! The first product, CADtools, was conceptualized in a university classroom in 1996. Brendon Cheves had recently graduated with a degree in computer interface design and was teaching part-time in computer-aided design. His students were using Adobe Illustrator to modify and enhance CAD files for presentation. They were burdened by the time and effort required to move back and forth between programs to merge graphics and dimensions. Brendon learned that Adobe Illustrator contained a plugin infrastructure that allowed programming of additional features. The first version of CADtools was released for the new Adobe Illustrator 7 in May 1997. CADtools was hugely popular with Adobe Illustrator users, appealing to many different types of professions including environmental design, sign design, architecture, manufacturing, engineering, technical illustration, etc. Hot Door continued to develop more plugins for Illustrator and Photoshop to meet specific design needs not met with the applications. Hot Door Harmony was released in 1998 for Photoshop -- a color selection tool based on extensive color theory research. By the end of 1998, Hot Door Transparency was released to offer new transparent effects in Illustrator. Transparency was equally successful in its short lifespan -- Adobe added transparency effects to Illustrator in 1999. Hot Door released both CADtools 2 and MultiPage in 2000. MultiPage offered a clever solution to bring publishing power to Illustrator with multiple page organization, printing, and PDF export. CADtools 2 was a major upgrade based entirely on user requests, offering new live dimensioning, multiple scales, and dozens of other features. The new Hot Door online store allowed for instant purchase and download, as well as the sale of third-party plugins. The Hot Door staff increased to include technical support and distribution specialists. 2000 was an accelerated year with products and people! CADtools 4 was released in 2005 with improved wall tools, path division, auto-dimensioning, and necessary compatibility with Illustrator CS2. Each version of Illustrator introduces new features and code changes which result in new challenges in plugin development. We were also proud of our own custom online store which debuted with CADtools 4, providing a user-friendly method of purchasing software with frame-based product configuration. In 2006 we completed compatibility upgrades for CS2, including MultiPage 3, CADpatterns, and Perspective for CS2. AppliCraft also updated CADgate for CS2 on Windows which added new DXF/DWG import and scaled export with Illustrator. After another year of development, CADtools 5 was launched in 2007 for Illustrator CS3 on Power PC/Intel Macs and Windows XP/Vista, improving project workflow with CADtools presets, label options, full screen cursors, and additional custom scale support. New tools include perpendicular and tangent drawing, fillet radius and offset tools by popular demand. MultiPage 4 and Perspective compatibility for CS3 followed. We continued our support of Adobe Illustrator with CADtools 6 in early 2009. New features include an innovative Scale calculator and tools for adjusting proportion and measuring distance. CADtools 7 quickly followed for CS5 compatibility, adding new art generation tools for tables, title blocks and door/window insertion. We are continually amazed by the work of our customers who use our products for thousands of different design tasks every day. We share the desire to simplify work with elegant tools that suit the designer as much as the task. Thank you all for your support -- and keep up the good work! Now you can create clean, professional documents with vector-based patterns that conform to ANSI standards. Over 130 patterns represent a variety of materials and textures including geometry, masonry, building materials, ground cover, wood, metal, flagstone, stone, tile, and geology. All patterns are easily edited and colorized. 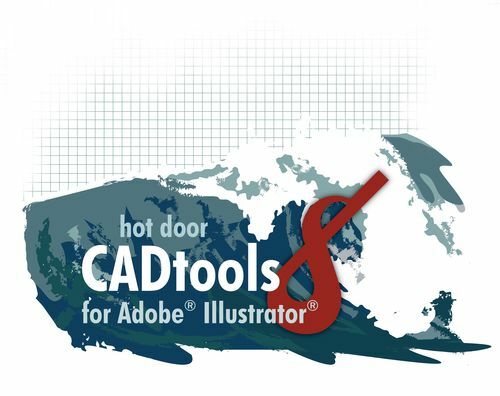 Hot Door CADtools 8 adds complete CAD power with precision drawing, dimensioning, editing and labeling tools inside Adobe Illustrator. Draw in any scale, dimension artwork with a mouse click, and numerically control objects like never before. Hot Door CORE™ technology dramatically improves speed and performance and ensures prompt release of new updates and upgrades for Ai Creative Cloud compatibility. CADtools 8 blends smoothly into the Illustrator environment so you can stay creative and constructive in one software program. Create documents with multiple pages inside Adobe Illustrator. Now you can control type, graphics and publishing in one environment. Use MultiPage to create, print, save and even export to multiple page PDF files. Version 4 adds support for PDF and EPS export for enhanced web and print design.